Anglické knihy pro děti. Známá série knížeček o chlapečkovi, co se pořád bojí. Ke čtení už pro trochu větší děti. 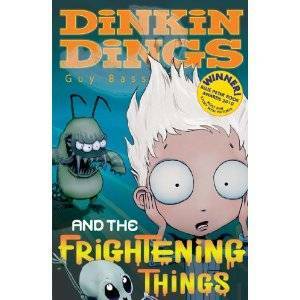 Dinkin Dings is afraid of everything - not just scary things, like being stuck in a lift with a hungry jaguar, but pretty much totally everything (apart from the monsters under his bed)!When Dinkin sees his new neighbours, he's certain that the girl next door is in fact a flesh-eating alien space zombie! But no one believes him. Can Dinkin, and his friends, The Frightening Things, rid the world of the evil zombies before the whole planet is turned into mindless flesh-eating slaves...?